Usually the German DFB-Pokal final does not make many waves outside Germany but, for once, it may get something close to the hysteria that the English FA Cup final receives. For while Hull and Arsenal will fight out the English FA Cup final in a Wembley Stadium game that does not excite many people outside Humberside and a pocket of London, the German DFB-Pokal final at the Olympiastadion pits Bayern Munchen against Dortmund in a blockbuster that demands attention. 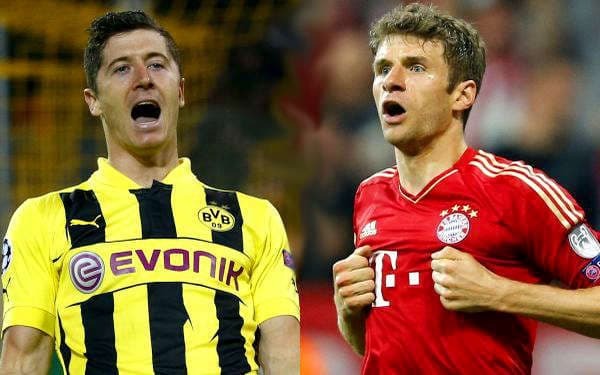 The German DFB-Pokal final in Berlin will be the fourth time that Bayern Munchen and Dortmund have gone toe to toe this term and the ledger, maybe surprisingly, favours BVB 2-1. Maybe not. Dortmund’s counter-attacking style is the ideal way to deal with Bayern’s possession-based approach provided that one has the defence to withstand the pressure that Pep Guardiola’s team generates because it has the ball for more than two-thirds of the time in most of its matches. Dortmund beat Bayern Munchen 4-2 in the German DFL-Supercup game played at the atmospheric home ground of the former not long before the German Bundesliga season kicked off. Perhaps one should not get too carried away with that result because Dortmund fielded closer to its strongest side than Bayern, with the away side missing regular goalkeeper Manuel Neuer and creator-in-chief Franck Ribery from its line-up. Bayern Munchen won its first German Bundesliga match versus Dortmund 3-0 on the road in November. Thomas Muller set up Mario Gotze for Bayern’s opener midway through the second half and Muller sealed the deal shortly after Arjen Robben used his left foot to bang home the visitor’s second goal. The reverse German Bundesliga fixture resulted in a 3-0 away victory as well. Dortmund transformed the game by opening the scoring in the 20th minute through Henrik Mkhitaryan, thereby forcing Bayern Munchen to throw more and more men forward in search of an equaliser as the clocked ticked. Bayern ended up having 14 shots at goal but Dortmund broke brilliantly to score another two goals early in the second period. Dortmund won 3-0 with just 29 per cent possession. Trying to pick the winner of the German DFB-Pokal final is a tough assignment but what does look fairly straightforward to forecast is that there will be goalmouth action and lots of it. Both Bayern Munchen and Dortmund know only one way to play and that means that Bayern is going to afford chances to Dortmund as Guardiola’s team pushes forward and Jurgen Klopp’s side counters at speed. So one really ought to be all over the various German DFB-Pokal final goal markets. An obvious German DFB-Pokal final bet is over two and a half goals at odds of 1.55 with 888sport and Bet365. But maybe it is worth a punt on over three and a half goals at odds of 2.40 with 888sport. This term’s games between Bayern Munchen and Dortmund are averaging four goals, three of Bayern’s last four matches have gone over three and a half goals and each of Dortmund’s last four games has gone over three and a half goals. In the recently completed German Bundesliga’s 34 rounds, Bayern’s matches averaged 3.44 goals and 15 of them went over three and a half goals, while Dortmund’s games had a mean of 3.47 goals and, likewise, 15 of them went over three and a half goals.